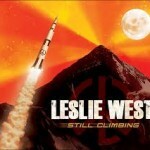 Share the post "Album review: LESLIE WEST – Still Climbing"
‘Still Climbing’ is an aptly title album and metaphor for the guitar heavyweight Leslie West who has rebuilt his career since his leg amputation. The album finds the former Mountain guitarist with a surprising amount of energy, drive and substance in his songs. There may be nothing groundbreaking here, but he sets himself some ambitious targets and fully realises them with carefully chosen guests, two and half successful covers (the closing ‘Rev Jones Time’ is an instrumental end-piece) and a real vibrancy to his playing that marks a significant return to form. Many of his latter career CD’s have been a jumble of blues and rock covers, and though they suggested he’s lost none of his fire, they lacked direction. This album is the prefect repost, and repositions him at the centre of the hard rock and blues market. ‘Still Climbing’ isn’t so much a rebirth as a successful return, built on careful planning and a rekindled enthusiasm and hunger to play and record again. The darkly titled ‘Dying Since The Day I Was Born’ is the perfect opening track, a hard rocking, bulldozing effort full of big riffs, a mighty tone and a trademark caustic growl, all wrapped up in a bone crunching rock arrangement. His gritty vocal is a step up from recent times and his sparring with Alter Bridge’s Mark Tremonti gives the song its edge. The thinly veiled theme of survival gives his guitar duet with Johnny Winter on ‘Busted, Disgusted Or Dead’, extra poignancy, especially as the title could refer to either guitarist, who crisply trade licks on a slide-led piece. ‘Fade Into You’ makes the best use of the quiet/loud dynamic, as Leslie’s gritty vocal evokes the lyrical meaning, before a mighty descending wall of sound topped by his melodic guitar line. Where Leslie was once part of Mountain – America’s answer to Cream – he’s finally matured as a solo artist to produce an album that his Brit counterparts would have been pleased to emulate. The difference is wholly in his singing, which injects the songs with the kind of feel, passion and commitment matched on ‘Fade Into You’ by a big production worthy of the man’s reputation. It took Leslie years to find the kind of consistency he enjoyed with the late Felix Pappalardi, but there’s real feel and substance at the root of these songs. Whether autobiographical or merely voicing life’s universalities, Leslie aims to make a real connection with his listener and having done so, his guitar takes over and does his speaking for him with a mixture of his deep tone and technique. Co- producer Mike Goldberg also seems to have shaved off the rough edges of Leslie’s œuvre without losing any of the big man’s essential spark. Leslie’s big toned signature is an ever present element, but the subtle production gives his solos a cutting dynamic edge. Sometimes the emphasis seems to be on the melody line, while on ‘Hatfield Or McCoy’, he slips and slides his way round the vocals, adding a depth to the stripped down piece. ‘Not Over You At All’ could almost be Stan Webb, save for the sudden wailing sax and ‘Tales of Woe’ is a deep ballad with an opening acoustic and a wailing electric tone, while the cover of ‘Feeling Good’ (a song everybody seems to be covering at present) perfectly suits his range as part of a fiery vocal duet with the mighty Dee Snider, who sounds like Sammy Hagar. The vocals are topped by a defining solo that makes it another album, if not career highlight. ‘Hatfield Or McCoy’ is a perfectly mixed song with a mighty slide break and a big hook, and Les returns to his soulful antecedents on James Brown’s ‘When A Man Loves A Woman’- he cut ‘Respect’ with The Vagrants back in ‘66 and ‘It’s a Man’s World’ 30 years later – with a duet with white boy soul singer Jonny Lang. It’s a decent effort predicated on the contrasting vocal styles, while Leslie’s intuitive guitar work brings presence to a classic that is hard to emulate at the best of times. He also dips back into his own back pre Mountain days for ‘Long Red’ with an updated layered production that features his younger brother Larry (from The Vagrants) and emphasizes the keyboard motif and chiming guitars. The song flows beautifully and the solo could almost be southern rock. And while the album tapers off slightly with the bluster of ‘Don’t Ever Let Me Go’ and the instrumental ending, ‘Still Climbing’ still sounds fresh and belligerent enough to reaffirm Leslie West’s place in the rock/blues pantheon. This entry was posted in ALBUM REVIEWS, ALBUM REVIEWS (Mobile), All Posts and tagged Cream, Dee Snider, Felix Pappalardi, Johnny Winter, Jonny Lang, Larry West, Leslie West, Mark Tremonti, Mike Goldberg, Mountain, Stan Webb, Still Climbing, The Vagrants. Bookmark the permalink.